Serena Williams is one of the best women tennis players in the world. You may know that she is from the USA. The 2005 Tennis Magazine ranked her as the 17th best player in 40 years. Serena Williams has had an outstanding career on the tennis court despite having to overcome several obstacles such as growing up in a tough neighborhood, the death of her older sister by shooting, and injuries. 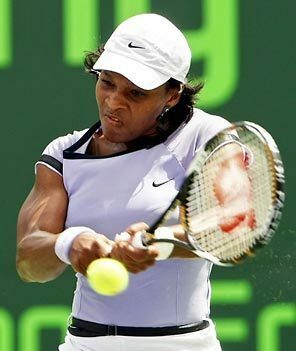 She has won 22 Grand Slam titles including 11 singles, 9 doubles and 2 mixed doubles. She has won all four Major Grand Slam titles in both singles and doubles. This is a significant achievement. She has also won 2 Olympic Gold Medals in women’s doubles. Serena Williams has been ranked the World Number 1 on five separate occasions as of July 2009. Serena’s achievements on the court have been well compensated. She has won more career prize money than any other female athlete in history! Serena was born on September 26th, 1981, in Saginaw, Michigan, to Richard Williams and Oracene Price. She is one of 5 sisters. Her elder sister Venus is also a former World’s Number 1 Women’s professional tennis player. Serena’s off the court passions include acting and fashion. Her latest TV credit is the reality show titled “Venus and Serena For Real” where cameras follow Serena and Venus on and off the court. She has also appeared in TV shows such as “ER”, “My Wife and Kids”, “Street Time” and “The Division”. Her voice was used in “The Simpsons” and Disney’s “Higglytown Heroes”. In fashion she was among the 10 individuals named “Fashion Trendsetters” by Vogue Magazine on a VH1/Vogue Television Special. She has founded her own clothing label named Aneres which has been featured in In Style Magazine. Serena recently published her autobiography ‘On The Line’. Serena Williams started playing professional tennis in September 1995. She was only 14years old. After a few years she entered the top ten world ranking for the first time in 1999 when she won several tournaments including her first Grand Slam victory at the US Open at age 17. In 2002 Serena won the Italian Open, French Open, Wimbledon and U.S. Open. She became the World Number 1 for the first time in July 2002. She was named Associated Press “Female Athlete of the Year”. In 2003 Serena won the Australian Open (singles & doubles), NASDAQ Open, French Indoors and Wimbledon. She became only the fifth woman in history to hold all four Grand Slam titles simultaneously. Sadly, her dominance of the women’s sport came to an abrupt end in mid 2003 when she had to undergo surgery to repair a partial tear in a knee tendon. Serena Williams started playing again in 2004. Her results in 2004 were not consistent. In the beginning of 2005 she won the Australian Open, her first Grand Slam title in 18 months. In the two years that followed Serena was only able to compete in 13 events due to injuries. Her world ranking suffered as a result and she went as low as 140 in July 2006. Serena returned back to form in early 2007 winning the Australian Open despite being ranked World Number 81. She also won the Sony Ericsson Open in 2007 and returned to the top 10 by the end of the year. In 2008 Serena won the US Open. Her win at the US Open made her World No 1, but she lost this ranking after 4 weeks when she lost in her first post US Open match. 2009 was a great year for Serena. She won the Australian Open. This victory made her the World Number 1 again and also the highest earner in the history of Women’s sports. Serena also partnered with Venus to win the doubles title at this event. At the start of the clay court season Serena had a four match losing streak which is the longest in her career. This losing streak meant that she lost her World Number 1 ranking to Safina. She came back at Wimbledon winning the Singles and Doubles titles with Venus. At the US Open Serene lost in the semifinals to eventual champion Kim Clijsters in a controversial match. Trailing 6-4, 6-5 (15-30) Serena’s second serve was called foot fault giving Kim match point. Serena lost her temper and was abusive to the woman line judge. The referee decided to penalize a point for this outburst and a previous racket abuse violation awarding Kim victory. The Grand Slam committee eventually decided to fine her $175,000 and put her on a 2 year probation so that if she commits another violation during the next two seasons at any of the Grand Slam events she will be banned from the next US Open. Despite this controversy Serena partnered with Venus to win the Women’s doubles at the US Open. Serena won the WTA Season Ending Championship for the second time. She finished the year as the World Number 1 for the second time in the career. She also beat Justine Henin’s record for the most money won during a season by a Women’s tennis player. Serena earned $6,545,586 during the year. Serena was named the Female Athlete of the Year by the Associated Press for 2009 and ITF World Champion in Singles and Doubles. Serena won the Australian Open defeating Justine Henin in the final. This win gave her at least one Grand Slam title in 3 decades (1990s, 2000s and 2010s) a record matched only by Martina Navratilova among women and Ken Rosewall among men. With her 5th Australian Open victory Serena has won more Australian Open Women’s Singles titles than any other player. She also won the doubles title with Venus. 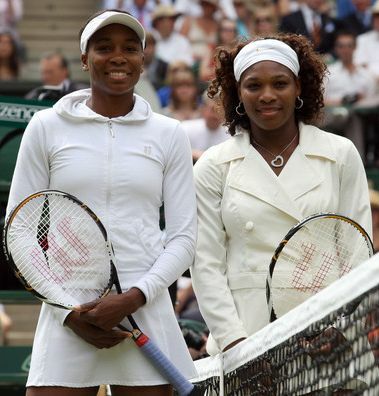 Serena Williams and her sister Venus Williams have an unique place in Women’s Tennis because the two sisters became two of the top players in the world during the same period. They have played each other in 21 professional matches going back to 1998. Serena has won 11 of these. Their meeting at finals of the 2001 US Open was the first Grand Slam Final contested by two sisters in the Open Era. Between the 2002 French Open and the 2003 Australian Open, the sisters met in all four Grand Slam finals. This was the first time in Open Era that the same two players had contested four consecutive Grand Slam finals. Serena Williams has taken the initiative to devote her earnings, time and energy to do charity work. Through her work with the Owl Foundation she helps fund programs that address learning problems for individuals who experience academic failure. Serena Williams also supports the S.E. Tennis and Learning Center in Washington, D.C., the Ovarian Cancer Research Fund, Race for the Homeless, Stop the Violence, the Special Olympics, and the Arthur Ashe Foundation.